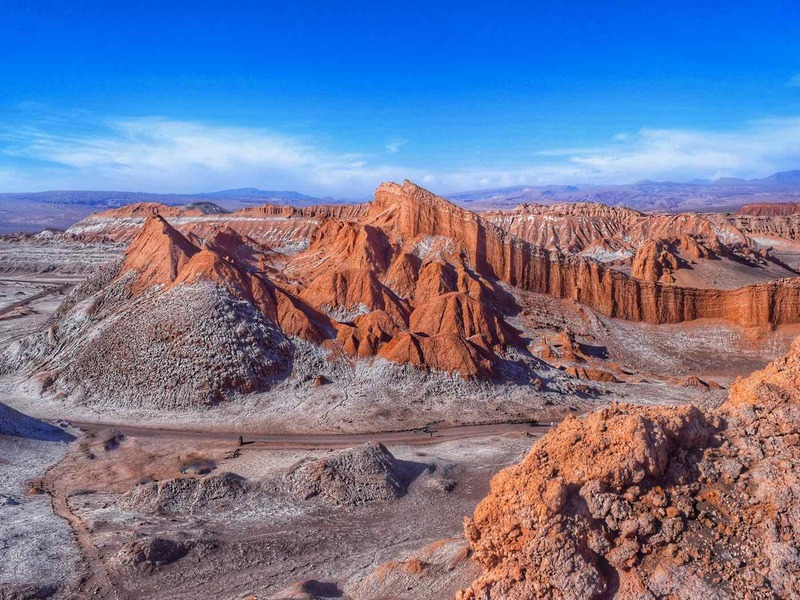 It’s time to travel to El Valle de la Luna in Northern Chile. 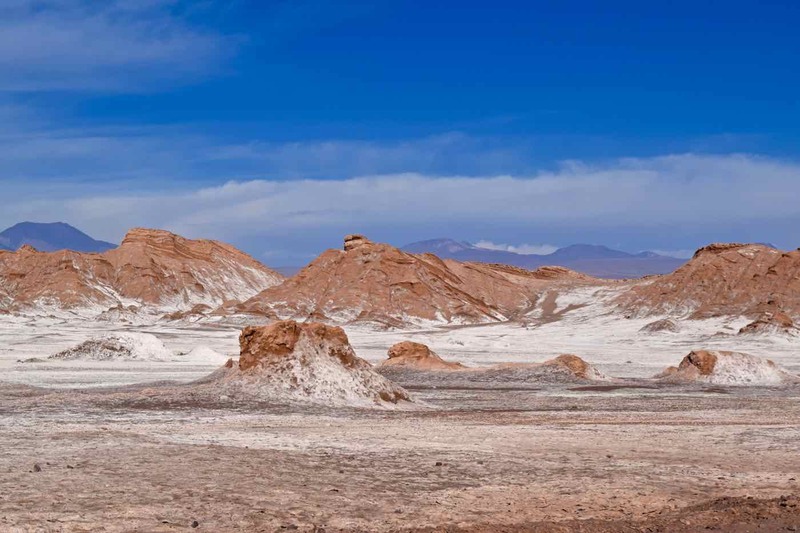 Rugged lunar landscapes, sand dunes, deep valleys and salt caves. 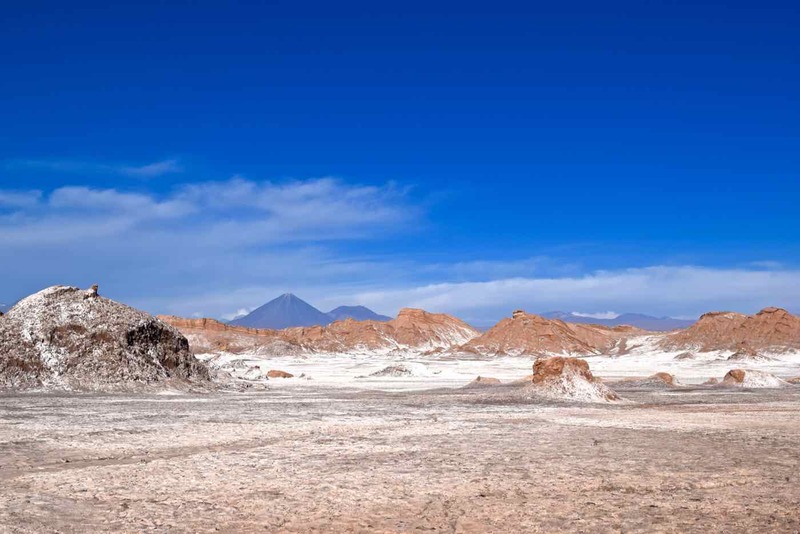 Welcome to Chile‘s Atacama Desert – the driest place on earth. It’s not everyday you feel like you’ve departed this planet, for another. 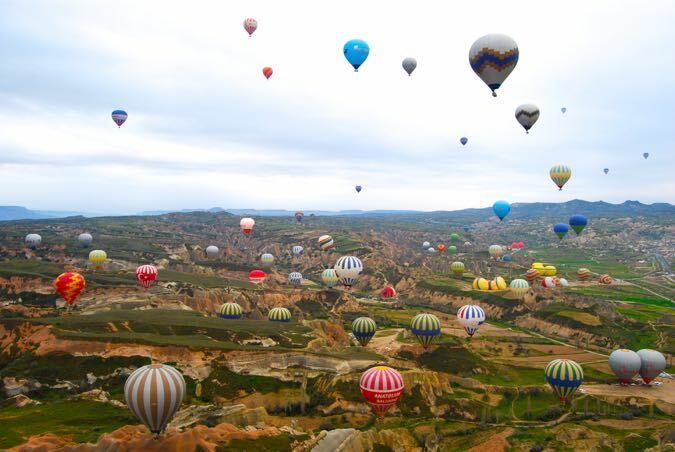 It’s a feeling I’ve experienced once before when I visited Cappadocia in Turkey, ballooning over the bizarre moon-like rock formations. 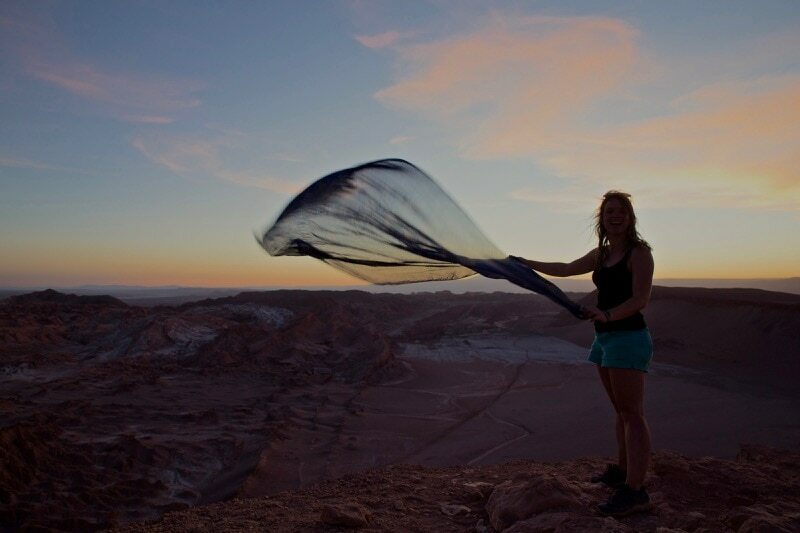 When I reached the Atacama region of northern Chile I genuinely felt like I’d landed on the moon… or Mars… or anywhere really, but Chile. 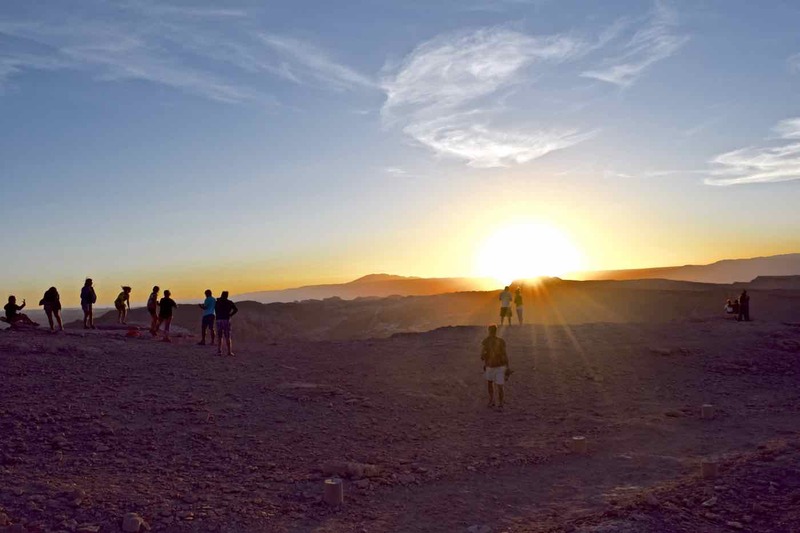 After flying from Santiago to Calama, we hopped on a bus to the tourist town of San Pedro de Atacama, right in the heart of the Atacama Desert. As I walked down the town’s main street I was overwhelmed by the number of tour companies, each with the same offerings. In short, you can’t visit this part of the world and not see the picture perfect lagoons, salt flats, bubbling geysers and the lunar valley. 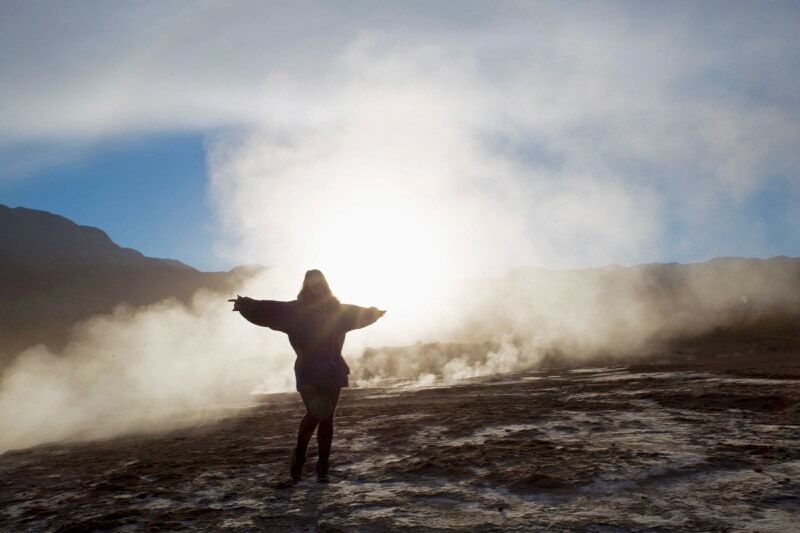 12 hours on from my 4am trip to El Tatio Geysers, it was time to hop back on board the bus to tour El Valle de la Luna – the moon valley. I was pleased to be reunited with Veronica – our warm, friendly tour guide from that morning. 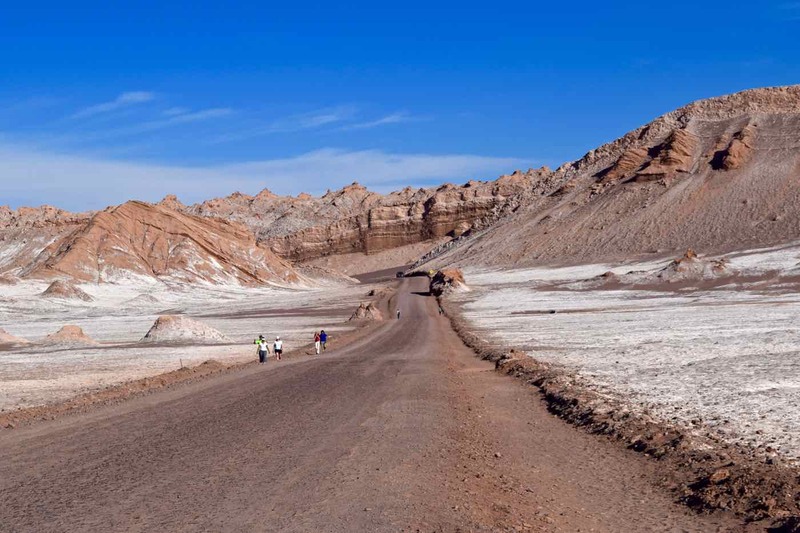 This tour would take us to see salt caves, rock formations, sand dunes and finish with sunset over the lunar valley. 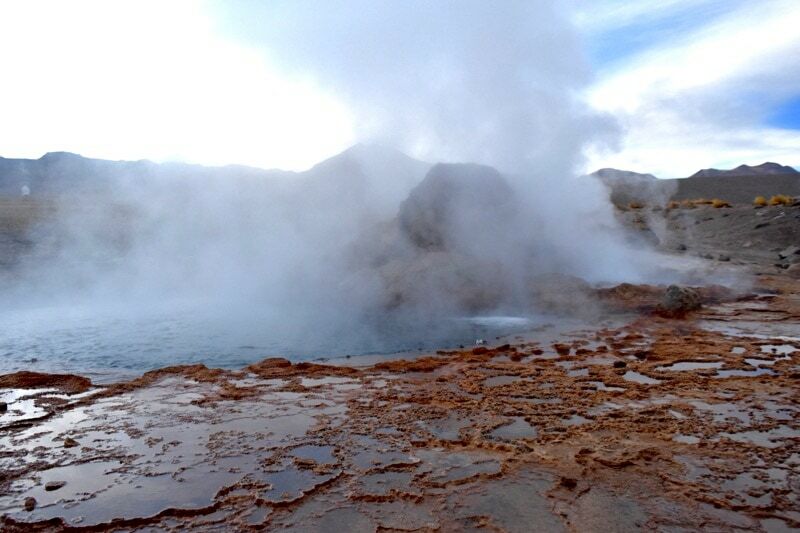 But could anything top the morning’s geyser tour…? 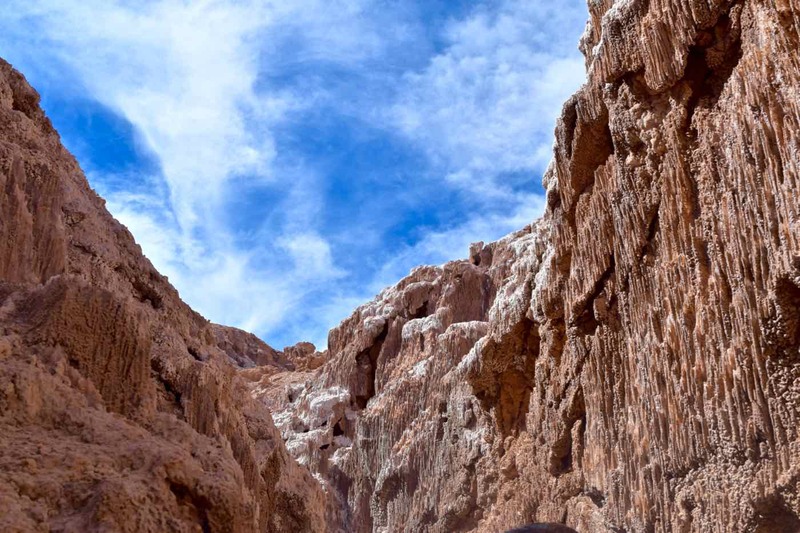 It took around 20 minutes to reach the first stop, Cuevas de Sal Cañon, or salt caves. Impressive rocks, a pale rusty colour jutted out in long ridges and peaks. On close inspection they were beautifully intricate, as though cascading waterfalls had frozen and been turned to stone. Some areas were bright white from the build up of salt and minerals. However… we were here to see caves, so it was time to get inside! While I don’t suffer from claustrophobia, those who do may want to skip this part of the tour – it’s a tight squeeze in places. 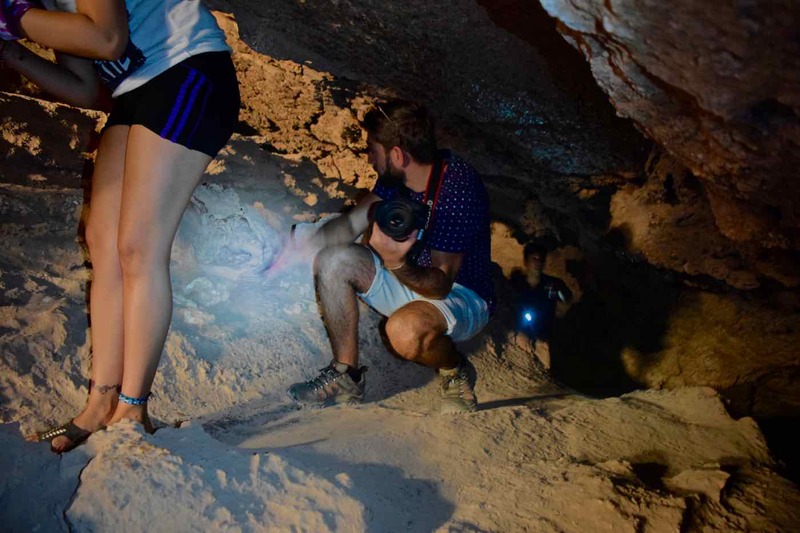 Using our mobile phones as torches, we edged inside and started to clamber over and under the rock formations. It was incredible to see the beautiful glistening salt crystals close up, like expensive diamonds… particularly when illuminated by torchlight. We weaved our way through the narrow tunnels for around ten minutes before reaching daylight again. We clambered up to a high point on the jagged rocks and took in our surroundings. It was baking hot, and against the bright blue sky, it really was a magical view. “Shhhhh” Veronica said. We sat in silence, enjoying the peaceful spot. A minute later she asked what we had heard. “Creaking?” a member of the group asked inquisitively. “Exactly,” Veronica replied. “These rocks are always moving – expanding and contracting…” Forgetting the geography, it sounded to me more like old souls trapped inside the rocks groaning to get out. Not somewhere I’d want to hang around after dark…Eeerie! 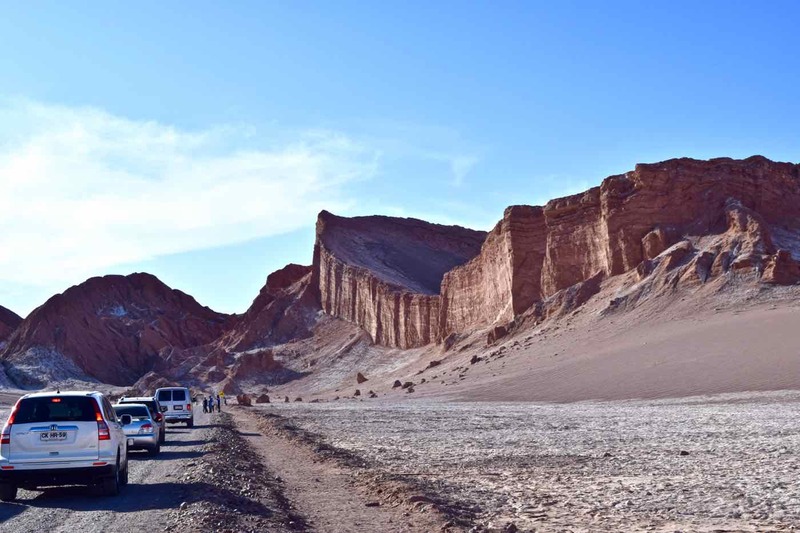 We drove through the incredible valley of the moon, past white craters of salt, rusty red rock cliff faces and perfect sand dunes. Feeling adventurous, we climbed up a steep path, attempting to grip onto crumbling rocks to reach another incredible viewpoint. As I looked out, it really was like being on another planet. The sky the bluest of blues, the rocks contrasting beautifully in their orange tones, dusted by bright white salt and then a perfect sand dune in the distance. Ok, this tour might just beat the geysers after all. 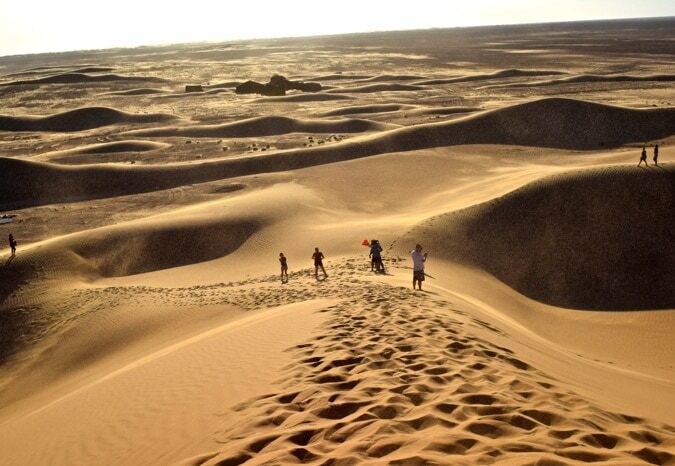 Towards the end of last year, I spent a few days in Morocco’s Sahara Desert. 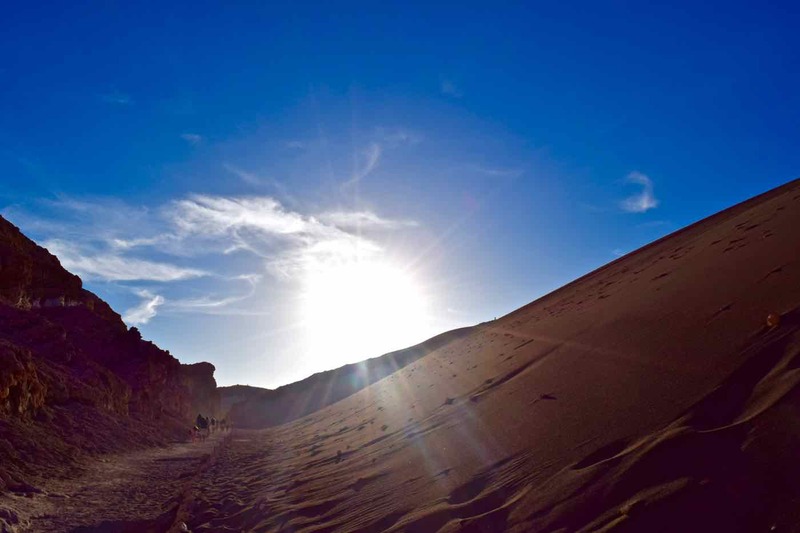 I loved running up and down the dunes… and the feeling of infinity as the dunes stretched as far as the eye could see. 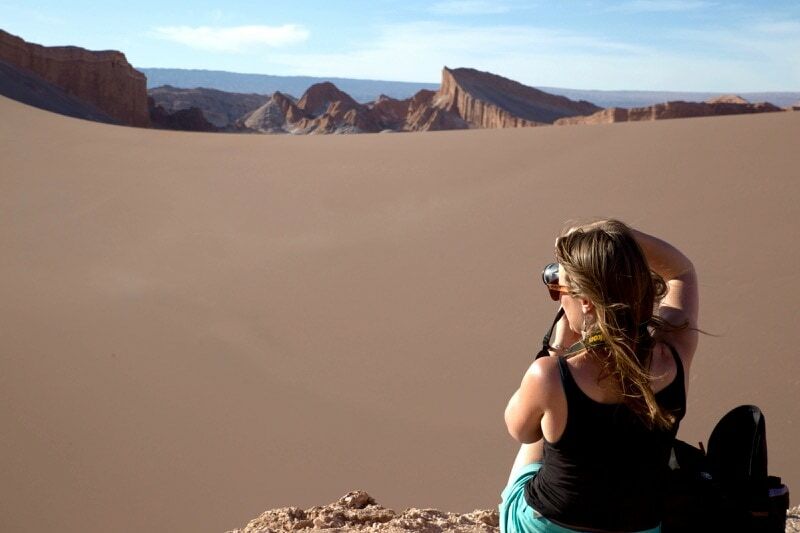 The sand dunes in Atacama seemed totally different. 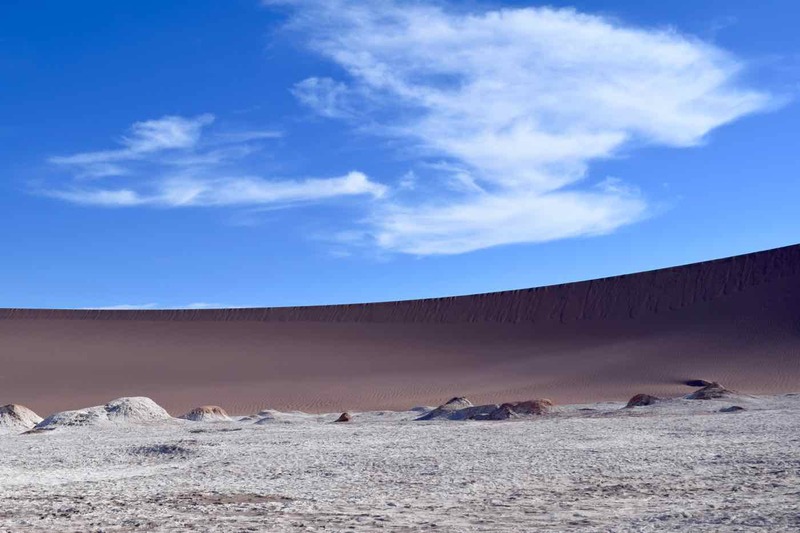 They were centred around one ridge (the Great Dune), which has been weathered by the wind over the years, with a few smaller dunes beyond, speckled with white rocks. Even though there were a lot of people enjoying the same view, there was a strange feeling of tranquility. I enjoyed the hike to the top and it was special to look out over the dunes. 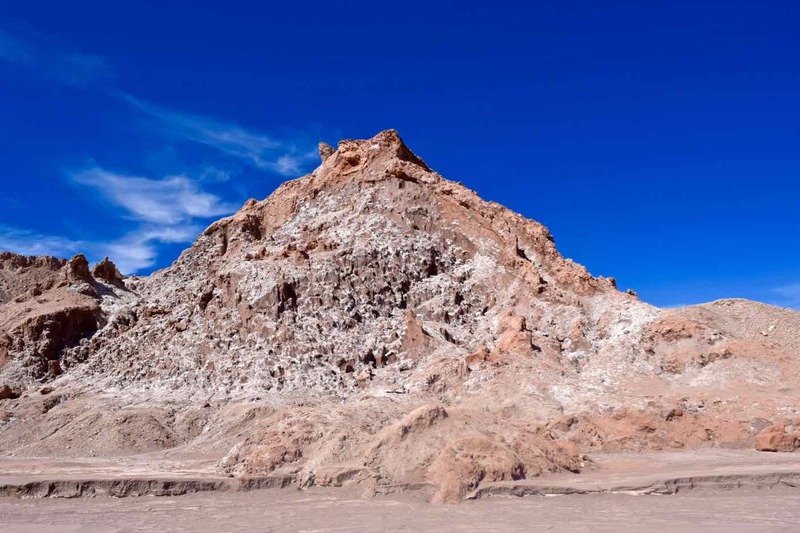 Find out more and book a tour of El Valle De La Luna. 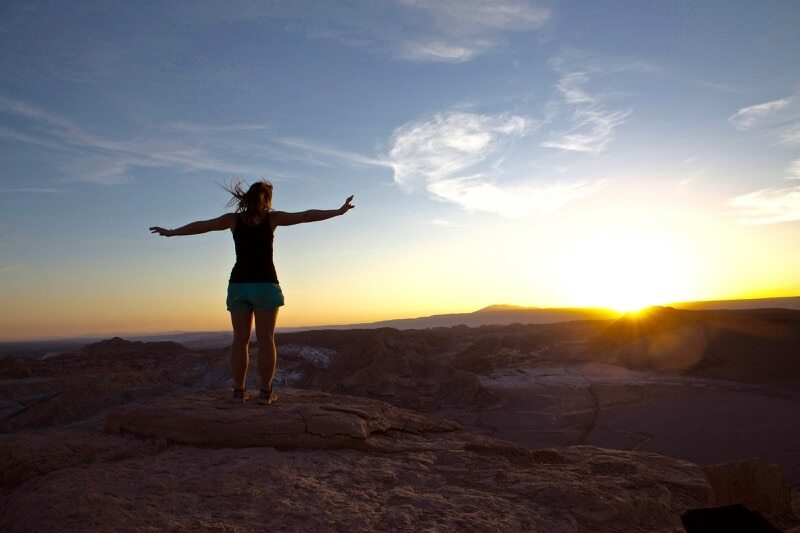 We raced on to our final stop, reaching the viewpoint overlooking El Valle De La Luna just as the sun was setting. Sunsets have the power to transport you to another place – and this one, overlooking the jagged rock formations, craters and salt patches was one of those. 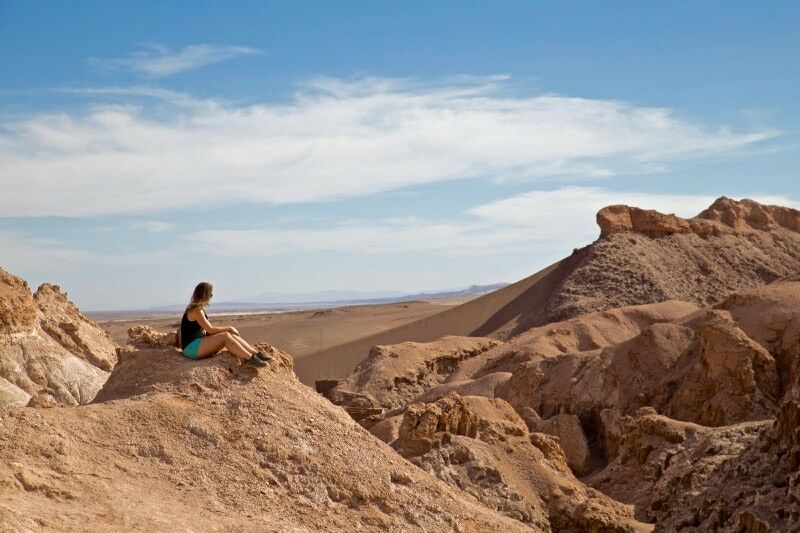 As I soaked up the last moments of warmth I reflected on my magical day in Atacama. 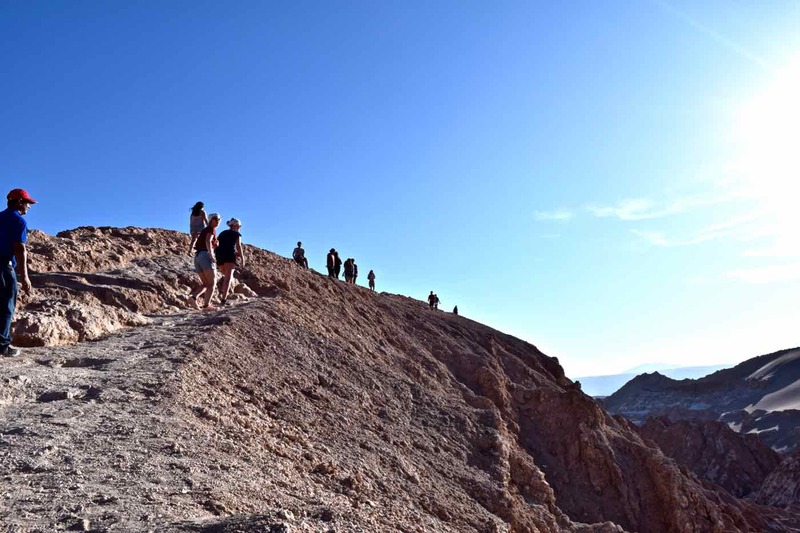 Bubbling, exploding geysers, mirror lagoons, salt crystal caves and now the moon valley. As days go, this one will be hard to beat. Be sure to wear hiking boots, walking shoes or heavy duty trainers. There’s uneven ground in the caves and I felt like I spent half the day clambering rather ungracefully up and down rocks and sand dunes! Bring a layer or two. I got a bit chilly once the sun started to set at our final stop. I had a scarf with me but would have appreciated a light cardigan or jumper. Not only did the temperature drop quickly, it was also quite windy. Water and suncream. Vital wherever you go in the driest place on the planet! Fitness. 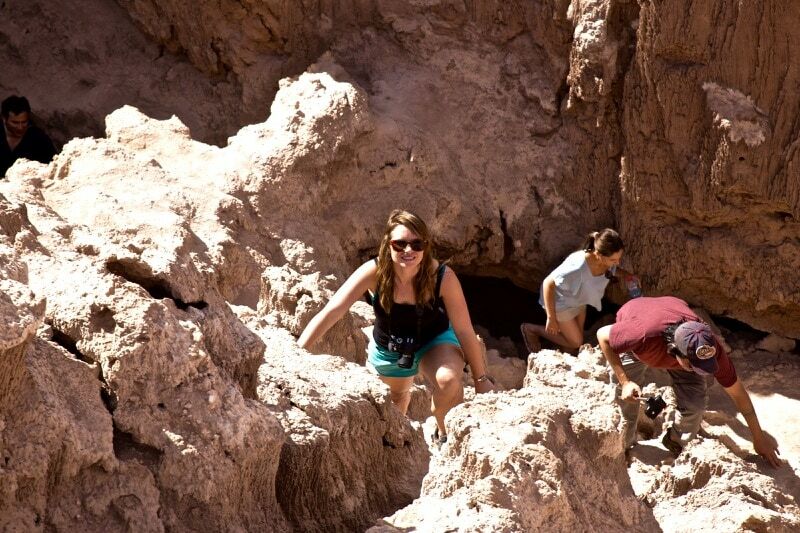 You don’t need to be terribly fit for this tour, but there were a few steep climbs. It’s worth bearing in mind if you find walking tough as you’re on your feet most of the afternoon. The guide should be able to adapt the tour accordingly. Photography. 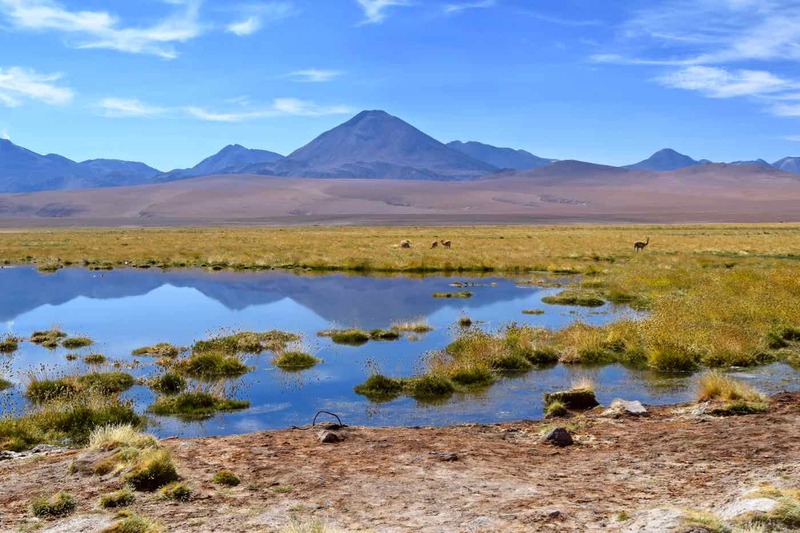 As with El Tatio Geysers, this is another very photogenic place. Watch out for sand getting in your camera. I learned the hard way in the Sahara so used my phone for a lot of the photos in the sand dunes here! Looks absolutely amazing, thanks for the tips! I’d love to go! These photos are absolutely breath taking! The sand dunes look majestic, so vast and smooth. This looks like an amazing place to visit!